Levi fires a noise round and tells the squad to keep moving forward. 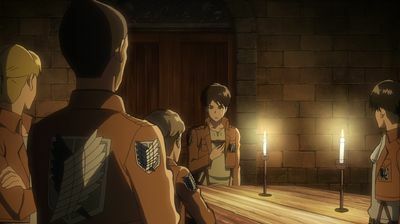 With more of the rearguard getting killed by the Female Titan, Eren begs his squad to let him fight but they tell him to trust Levi's decision. Eren starts remembering when Hange, Levi, and his squad had him try to transform into a Titan for experimental purposes.